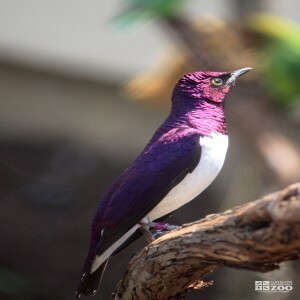 The range of the violet backed starling is Senegal, Somalia, Namibia, and Botswana. The violet back starling inhabits open arid riverine woodland up to 2500 meters high. Violet backed starlings are very common and tend to be migratory depending on the season, sometimes in large flocks. Reproduction varies depending on location, but breeding is usually in spring. Violet backed starling nests are in tree or fence holes only 2 to 6 meters above ground. The breeding pair both feed the young.